Unfolding with grace and precision, Lee Chang-dong’s slowburn Korean mystery is beautifully executed. 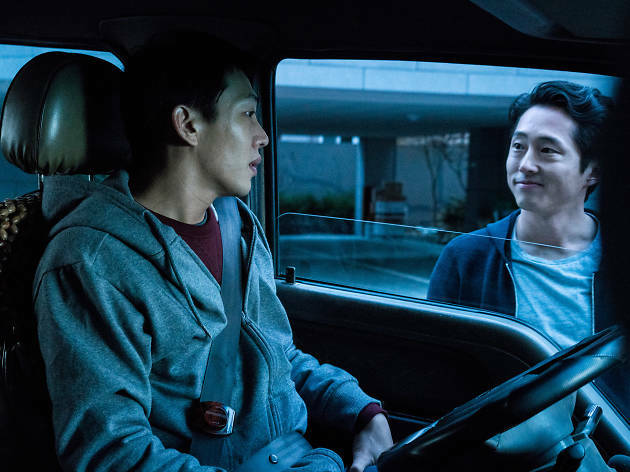 Novelist-turned-writer-director Lee Chang-dong may not be the most prolific filmmaker around – he made his last film, ‘Poetry’, back in 2010 ­– but when he does get to work, the results are usually highly impressive and this, his sixth feature, is no exception. Inspired by a short story by Haruki Murakami (which was itself inspired by a story by William Faulkner), it centres on Jong-soo, a farmer’s son-turned-deliveryman who dreams of becoming a writer. One day in Seoul he meets Haemi, a girl he half-remembers from school. Soon she’s asking him to feed her cat while she travels to Africa, then seducing him. So when she asks him to meet her at the airport, he’s put out to find her in the company of wealthy sophisticate Ben, who immediately treats them to a meal. Soon, Jong-soo is wondering if they’re more than friends. It’s just the first mystery in a movie rich in teasing ambiguities and possible lies. When Haemi suddenly disappears from Jong-soo’s life, he naturally suspects Ben of having something to do with it. Might the handsome hotshot, who during one weed-fuelled conversation boasted about his bizarre hobby of burning down greenhouses, have murdered the young woman? Lee’s interest lies not in crime-solving but in exploring Jongsu’s emotional confusion. He takes against Ben partly out of sexual jealousy, partly because he inhabits a world the farmboy barely knew existed. Jong-soo’s increasing torment allows the filmmaker to touch subtly on the current social, economic and cultural divisions within Korea. Both a slow-burn suspense drama and an intriguing enigma, his film is beautifully executed throughout: the three lead performances are all spot on, while Mowg’s jazzy score and Hong Kyung-pyo’s immaculate camerawork fit the shifting moods to perfection. Any work by Lee Chang Dong is worth watching and Burning is no exception. In a past year of films full of so much hyperbole this is a truly quiet, dark wonder. Great performances from Ah-in Yoo & Jong-seo Jun in a story that will linger long in the mind. Brilliant!